16 original coins, including 5 silver coins. 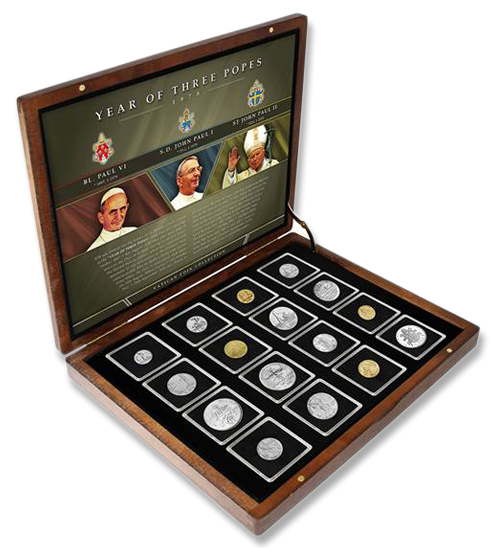 Includes the silver 1000 lire John Paul I coin issued during his short 33 day term. Supplied with a certificate of authenticity in a beautiful wooden display case. The year 1978 will always be remembered by the Roman Catholic Church as the “Year of Three Popes”. Pope Paul VI (26th September 1897-6th August 1978) died after more than 15 years on the Chair of Saint Peter. During his term in office, the Second Vatican Council, which was concerned with questions of the reformation of the Christian faith, came to an end. After his death, a 20-day sede vacante (time when the chair is unoccupied) took place. On 26th August, Albino Luciana (17th October 1912 – 28th September 1978) was chosen as his successor. He took the name John Paul I by combining the names of his two predecessors and quickly became known as “the smiling Pope” for his good humour. Tragically, he controlled the fate of the Vatican for only 33 days before he died suddenly in his sleep on the 28th September. Once again, the cardinals held a conclave and after only 18 days of sede vacante, elected Karol Wojtyla (18th May 1920 – 2nd April 2005) from their ranks to be the new Pope. The former Archbishop of Krakow, Poland became the first non-Italian Pope since Adrian VI (1522-1523). He chose the name John Paul II in order to provide continuity after the turmoil caused by the sudden death of his predecessor. His 26 year pontificate was to become one of the most remarkable in history, both for its length and accomplishments. When he died in 2005 he had occupied the Chair of Saint Peter for longer than all but one of the Popes that had gone before him.